This entry was posted in Cars & Automobiles, Home Improvement. Bookmark the permalink. The Mercedes-Benz SLS AMG GT3 is an awesome car! It is a non-streetable racer built to comply with FIA (Federation Internationale de l’Automobile) GT3 regulations. It is a great car for customers with money (it costs $456,500) that love to compete in long- and short- distance events. There will only be 20 of them made this year, but Mercedes-Benz will make 30 in the 2012 year. in racing slicks. The brakes are motorsport-spec steel brake discs with six-piston front and four-piston rear calipers. 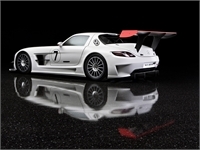 The SLS road car has optional carbon-ceramic brakes, but they are outlawed in GT3-class racing. Now to the good stuff! The car has a 5.2 liter V-8 that will make about 600hp at 6800 rpm and 500 lb-ft of torque at 4750 rpm. The car will also weigh less than 3,000 lbs. It comes with a 6-speed automated manual and will do 0-60 mph in 3.2 seconds and 0-100 mph in 7 seconds flat. The ¼ mile will go by in 10.9 seconds and the car’s top speed is a drag limited 187 mph. Wow! This car is going to be insane once it comes out! If I had that kind of money I would definitely buy one! If anyone has the pleasure of owning one or driving one, please send me a comment and let me know. Thanks for reading!